I love this picture of Didge. 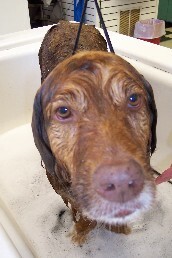 I took it back in April 2005, when Colin and I had the mutt in a tub at the Dog-O-Mat in Ann Arbor. Needless to say, Didge is not a big fan of bath time. He sort of puts up with it as a necessary evil. After Didge tipped over the kitchen trash can and strung the contents all over the dining room this afternoon, I'm tempted to give him another dose of bath time as sweet, yet gentle revenge!! On the other hand, he does love the hairdryer. I guess there's a bright side to everything when you're a dog. My e-mail inbox is empty. Sigh. What a cute picture of Didge!!! He looks so funny!! You should see me when I'm trying to give Roxy a wash-down after we've been to the beach. I basically have to chase her around the yard with the hose while she scampers just out of reach. Ugh. Your email inbox won't be empty for long...I will write as soon as I get the chance! Enjoy the reunion. We went to Mairi's "five year" (I didn't even know they celebrated five year reunions) a while back and it was interesting to say the least. Good luck with the interview. If the department knows what's best, they'll hire you on the spot. We sure miss you in our neck of the woods.